Reading time: about 15 minutes. 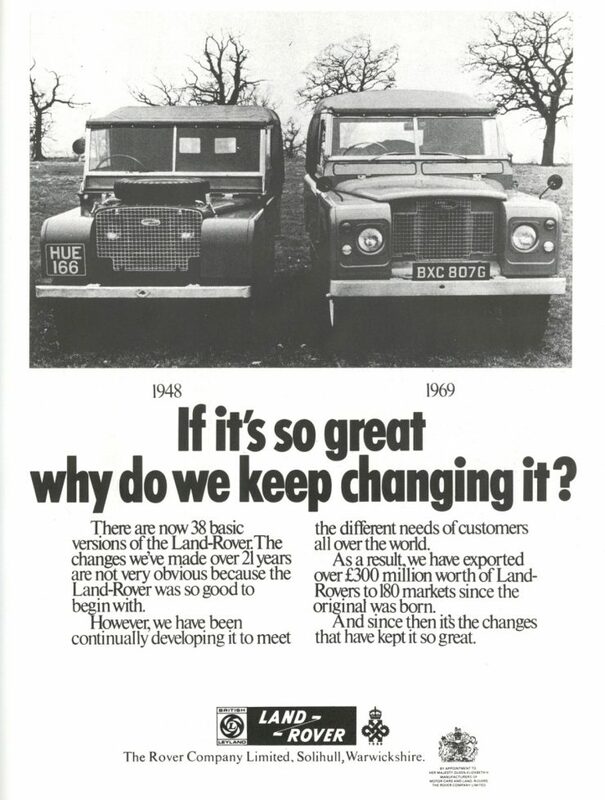 Building such an agricultural vehicle as the Land Rover was not at all what Rover had envisaged themselves doing. 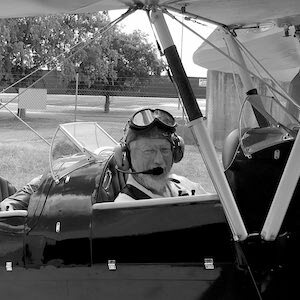 Land Rover designer Maurice Wilks had spent part of the war years working in top secret on Sir Frank Whittle’s jet engine and had developed a gas turbine that had potential for use in passenger and commercial vehicles. He was without doubt keen to continue work to create a whisper quiet motorway cruising gas turbine Rover passenger car and indeed he would go on to bring that project almost to completion. But with Rover faced with closure if he could not come up with a viable vehicle that would satisfy the government’s demands for utilitarian practical vehicles which could be exported in quantity, Maurice turned his talents to creation of something agricultural and not at all jet powered. So as he sketched out his original idea for this 4×4 Rover that would be for “the land” (i.e. agriculture) in the beach sand near his farm on the island of Anglesey, it was in all probability not the most exciting thing he’d ever worked on, but he gave it his best shot figuring that if he couldn’t come up with a better vehicle than the American Jeep then he shouldn’t be in the car design business. When Maurice Wilk’s Land Rover made its debut in 1948 it became an instant success and this caught Rover by surprise. 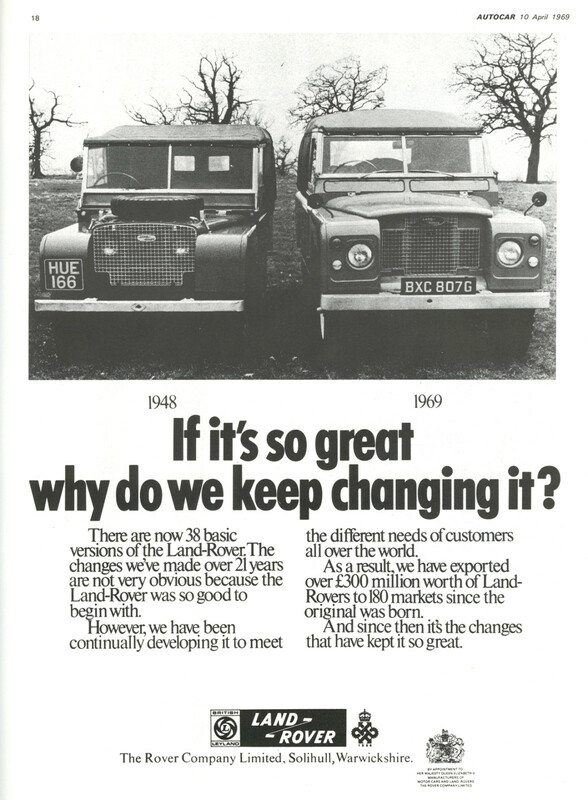 Sales of the Land Rover would outstrip sales of Rover luxury cars by a margin of two to one, and the humble “Landy” was destined for a 68 year production run. 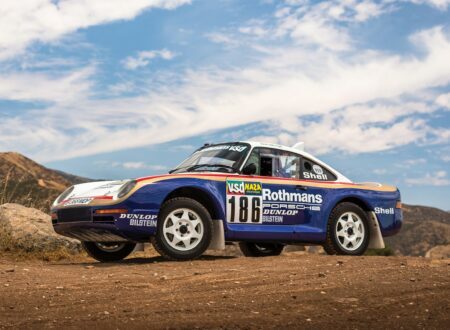 Once it was realized just what a hot seller this vehicle was, and just how much it was promoting the Rover name, as well as filling the Rover coffers, work was begun on figuring out what needed to be improved on this “stop-gap” utilitarian car to keep it ahead of all competitors. 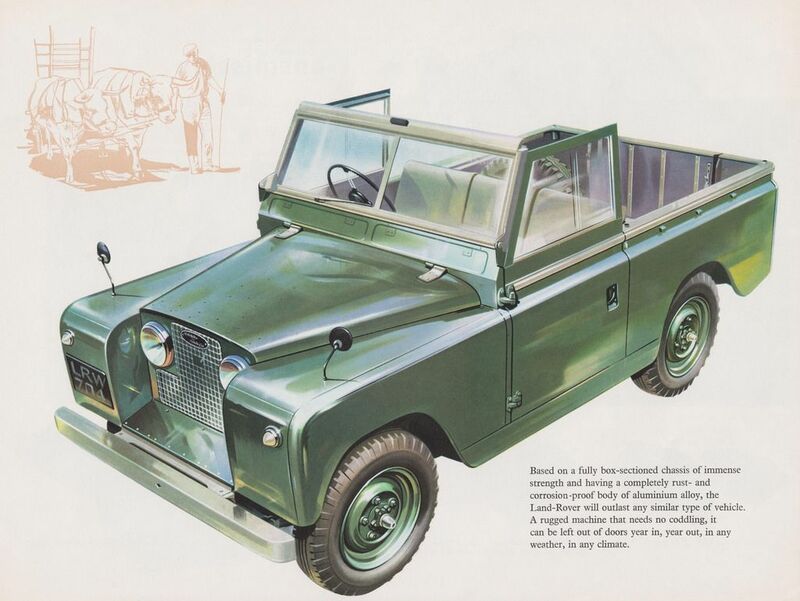 Rival car maker Austin were working on similar four wheel drive vehicles for military and agricultural use and so Rover needed to make sure their Land Rover was the best four wheel drive on the market. In improving the original Series I Land Rover Maurice Wilks and his team understood that they needed to keep the valuable features of the vehicle, features that were essential for a military vehicle, an expedition vehicle, a vehicle that was used in the African bush and the Australian outback, places where a vehicle failure could put the occupants in danger of their lives. The Oxford and Cambridge Trans-Africa Expedition and their even more ambitious Far Eastern Expedition had been a great publicity boost for the Land Rover, but also demonstrated just how much people would rely on this vehicle. So the improved Land Rover was designed not only to be as reliable as possible, but it was also designed so that any repair could be done out in the bush, miles from a workshop. It was even possible to do an engine overhaul with the engine block remaining in the vehicle. The rear main oil seal could be replaced without removing the engine or gearbox. For those who grew up in a Britain in which the “Meccano” set was a boys favorite toy, this was a grown-up’s “Meccano” set on wheels, perfect for “Boy’s Own” adventures. 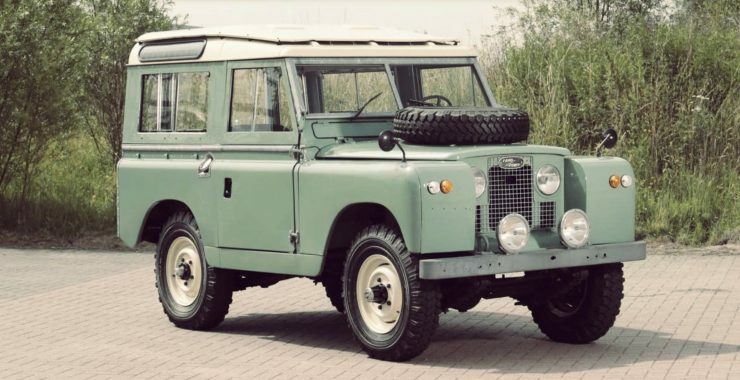 Introduced in 1958, ten years after the Series I, the Land Rover Series II required some re-styling to accommodate the improvements that had been made underneath that sporty aluminum body. The axles were changed and gave the Series II a wider track of 4’3½”. The improvements to the axles and steering reduced the vehicle’s turning circle. The Rover styling department were given the job of re-styling the car but clearly told to keep it as simple and repairable as possible. The modest styling improvements included the curved waist-line that would be a characteristic of all the Land Rovers to follow. This kept the body pressing to a simple curve, and covered the wider track nicely. Rover stylist David Bache kept the changes to the vehicle subtle. He created a neat curved-back cab for the utility version with curved rear side windows and a quite stylish curved roof. He also fitted side skirts to hide the chassis and cover the fuel tanks mounted under the front seats where fitted. The end result was a vehicle that looked a bit less like a cobbled together “Meccano” set car and more like a professionally finished all purpose vehicle. 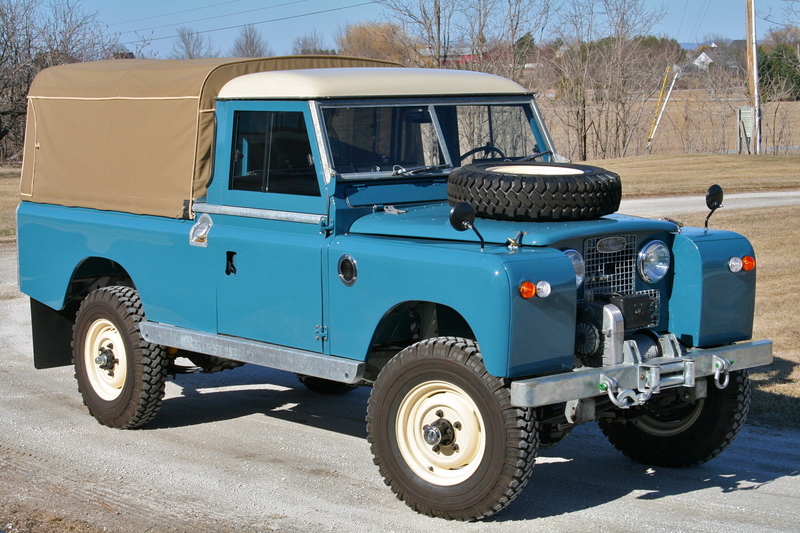 The Series II was made in 88″ SWB (Short Wheelbase) and 109″ LWB (Long Wheelbase versions). The early examples of the Short Wheelbase being fitted with the same 2 liter four cylinder engine as the Series I until the stock of those engines ran out in the summer of 1958. After that the new 2.25 liter four cylinder OHV engine was fitted, and all Long Wheelbase 109″ Series II were fitted with that engine from the beginning of production. This new 2.25 liter (2,286cc) overhead valve engine produced 70bhp @ 4,250rpm which was a useful increase over the previous 2 liter engine’s 52bhp. 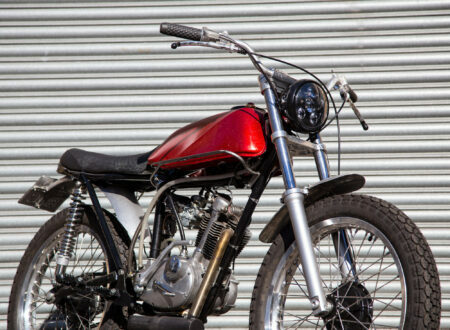 The new engine was fitted with a single Solex carburetor and produced torque of 124 lb/ft at 2,500rpm. In addition to the 2.25 liter petrol/gasoline engine a diesel four cylinder engine of 2,052cc was also offered. 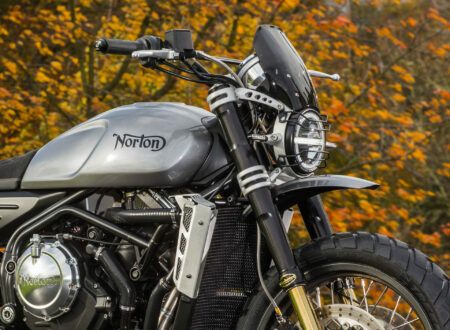 The diesel produced power of 51bhp @ 3,500rpm and torque of 87lb/ft @ 2,000rpm. This version of the diesel engine remained in production until 1961. The Series II was fitted with the style of transmission that would remain standard all the way through to the Series III. The gearbox was a four speed manual with synchromesh on third and fourth gears (by 1972 the Series IIa LWB utility would be all synchromesh). Four wheel drive could be engaged by depressing a sprung button just below the gear-lever, which was quite convenient. There was a gear-lever to select low or high range gears, with the need to stop the car to engage low-range. The Series II had differentials for the front and rear axles, but not between front and rear, so four wheel drive was only to be used on loose surfaces. Brakes were hydraulically actuated and for the 88″ Short Wheelbase model were 10″x 1½” drums front and rear with an additional cable operated drum brake on the transmission for the handbrake. The Long Wheelbase model was fitted with larger 11″x 2¼” drums front and rear. Front and rear suspension was by half-elliptic leaf springs with steering by recirculating ball and nut. The only Series I version of the Land Rover that was not updated to the Series II in 1958 was the 107″ LWB Safari Station Wagon. This was not taken out of production until 1959 when it was replaced by its Series II version. The 109″ Series II LWB Station Wagon was made with two banks of forward facing seats to seat six, whilst in the small rear section were two side-facing bench seats into which could be crammed another six people, albeit not in much comfort, making the Series II Station Wagon able to be licensed as a twelve seater bus, avoiding some UK taxes and making the purchase price of this version somewhat cheaper. The Series II would remain in production from 1958 until 1961 after which it was replaced by the Series IIa. One of the strangest of the Series II Land Rovers made was the Cuthbertson Tracked Vehicle. The Cuthbertson was not actually made by Rover but by James A. Cuthbertson at his workshops in Biggar, Lanarkshire, Scotland. James Cutherbertson actually began working on Series I Land Rovers but his version fitted to the Series II in 1958 is the more famous. The Cuthbertson conversion involved the creation of a sub-frame with tracked wheel bogies front and rear which was bolted to a Land Rover’s chassis. 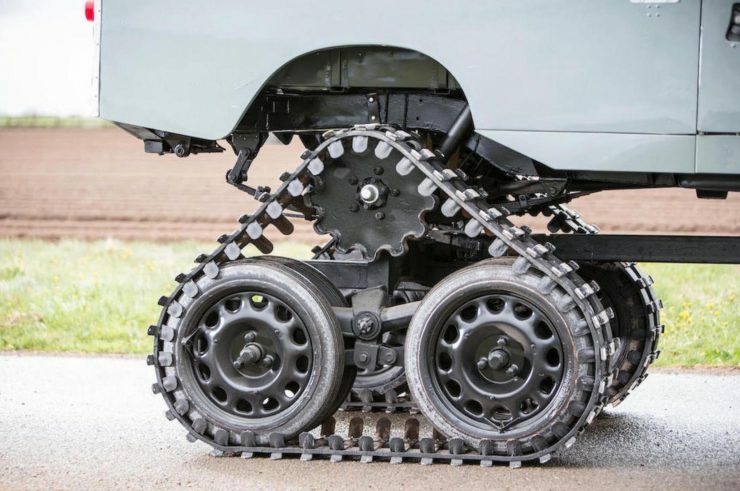 The tracked wheel bogies aligned with the Land Rover’s axles, which were modified to provide the drive to the tracks by fitting sprockets in place of the wheels. The Cuthbertson featured a crankshaft driven power steering system to provide the necessary assistance to make steering the vehicle a reasonably achievable task. The Cuthbertson was strictly an off-road vehicle with the ability to go places an ordinary Land Rover could not. They found use in vehicle recovery and in the military for mine clearing operations. The Cuthbertson had a large footprint and so put a low pressure on the ground which meant it had a low environmental impact and was used for maintenance by telecom and other service providers. The company continues to this present day making innovative equipment. 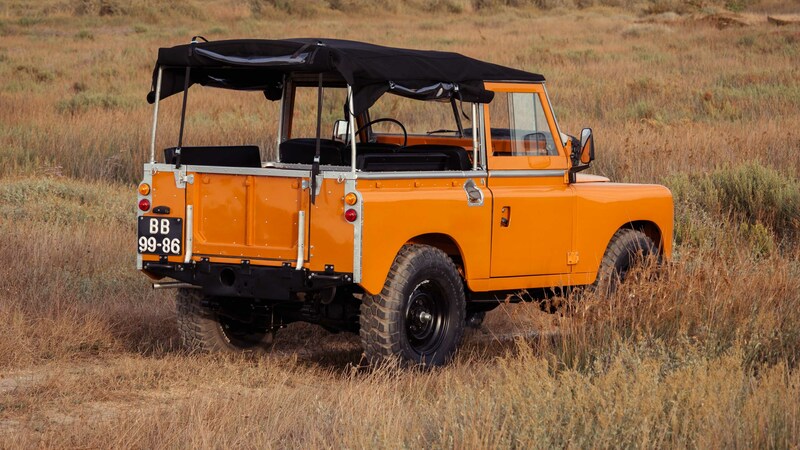 The Series IIa revised version of the Land Rover made its debut in 1961 and is regarded by many Land Rover aficionados as the version that Rover got right. It is generally thought of as the most durable and easily repairable of the “Series” Land Rovers. The “a” suffix of the Series IIa name came about when Rover adopted a new system of adding a letter suffix rather than prefix to chassis numbers of vehicles when significant model changes were made. During production of the IIa the actual suffix on the chassis number progressively moved further down the alphabet, but the model designation remained IIa regardless however. 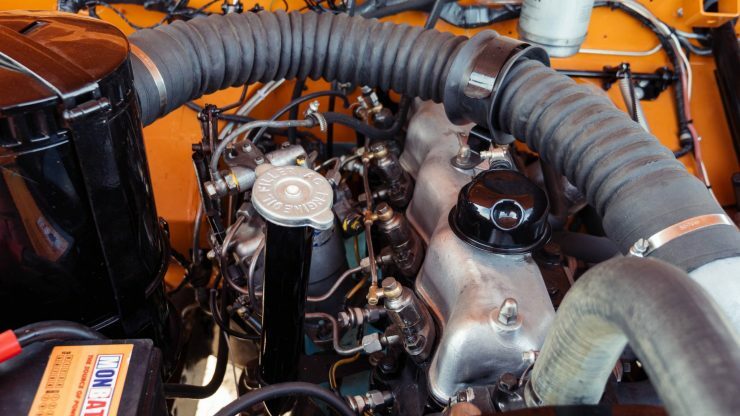 The Series IIa petrol/gasoline engine remained the same 2.25 liter in-line four cylinder unit of the Series II, but the diesel engine was enlarged to 2,286cc in 1962: this engine producing 62bhp @ 4,000rpm and torque of 103lb/ft @ 1,800rpm. The engine used CAV fuel injection. In 1966-1967 LWB models could optionally be fitted with a Rover IOE (Inlet Over Exhaust) six cylinder engine of 2,625cc capacity which in its base form for the Land Rover produced 83bhp @ 4,500rpm and torque of 128lb/ft @ 1,500rpm. Vehicles equipped with this engine feature slightly larger 11″x 3″ drum brakes. Interestingly this more powerful 2.6 liter engine acquired something of a mixed reputation by comparison with the 2.25 liter four cylinder despite its greater power and, on paper at least, greater torque at lower revs. There are some variations that occurred during Series IIa production. The early models featured headlights in the grille just like their Series I forebears. This had to be changed however because of new regulations in North America. For this market the headlights were moved to the front of the fenders/wings in 1968. 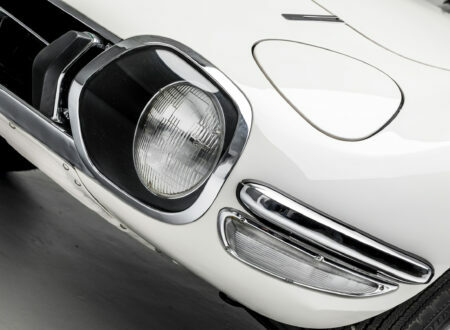 These “Federal” models were transitional and the headlights were not recessed, giving these models the nickname “Bugeye”. These transitional cars were made until 1969, by which time the recessed headlights on the fenders/wings became the norm. 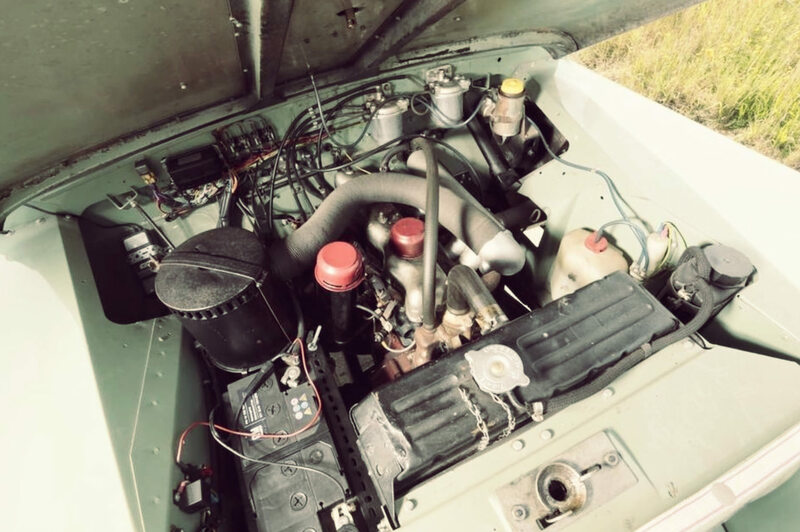 The Series IIa received progressive improvement over its production life with the LWB 109″ utilities being fitted with the fully synchromesh gearbox and Salisbury axle in 1972, making these last examples a transitional model heralding in the Series III. Between 1963-1964 a lightweight “Air Portable” version of the Long Wheelbase Series IIa was created for British military use. This model did not go into full production and was essentially a development prototype. The “Airportable” was designed so they could be stacked in a transport aircraft, although that stacking required removal of some parts and clamping of the springs. One of the versions of the Airportable was made into an amphibious vehicle by waterproofing the body and the fitting of flat airbags to the front and sides of the vehicle. These amphibious Land Rovers were fitted with a propeller whilst steering was by the front wheels. Only 28 of the amphibious versions of the Airportable were made and all bar one were fitted with the standard 2.25 liter four cylinder engine. The sole exception was one fitted with a Rover gas turbine engine. This was the period in which Maurice Wilks and his design team were inching closer to a practical gas turbine powered car and had already shown a number of working prototypes. The design parameters of the SWB Lightweight required that the vehicle be made narrower, so that they could be transported two abreast in the transport aircraft of the time. Not only that but the model had to be light enough to be transported by a Westland Wessex helicopter. This version did enter production as a military special model with 2,989 being built. All were fitted with the standard 2.25 liter OHV four cylinder engine. In order to be lifted by the earlier helicopters the SWB Lightweight had some non-essential parts removed such as doors to lighten it, but later model helicopters were capable of lifting the complete unmodified vehicle. Between 1966-1967 Rover built 811 special versions of the LWB Station Wagon in left-hand drive for the North American market. These cars were fitted with the IOE 2.6 liter six cylinder engine in the higher state of tune of the Rover 110 passenger car complete with a cylinder head designed by Harry Weslake. This initially promising model fell victim to the emissions regulations that were coming into force in the United States forcing production to be ended after only about a year. 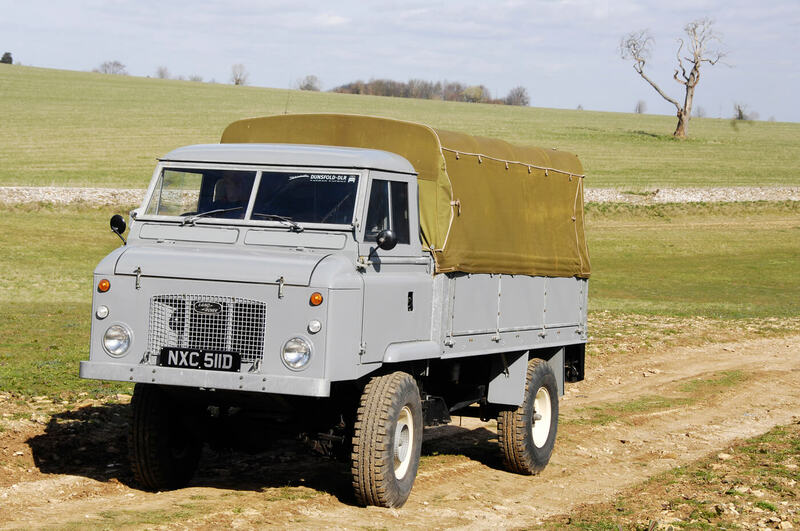 In order to maximize the utility of the Land Rover Series IIa a cab-forward model was created which was called the Forward Control. The idea was to make the LWB Land Rover into a four wheel drive small truck with a 30 cwt (1.5 metric tonnes) capacity, by moving the driver’s cab to the front of the vehicle thus greatly increasing the load area at the rear. To create the tray top rear body a sub-frame was created and welded to the chassis. The tray-top body was often fitted with drop-down sides. Wheels and tires were slightly larger than the standard Series IIa being 9.00″x16″. 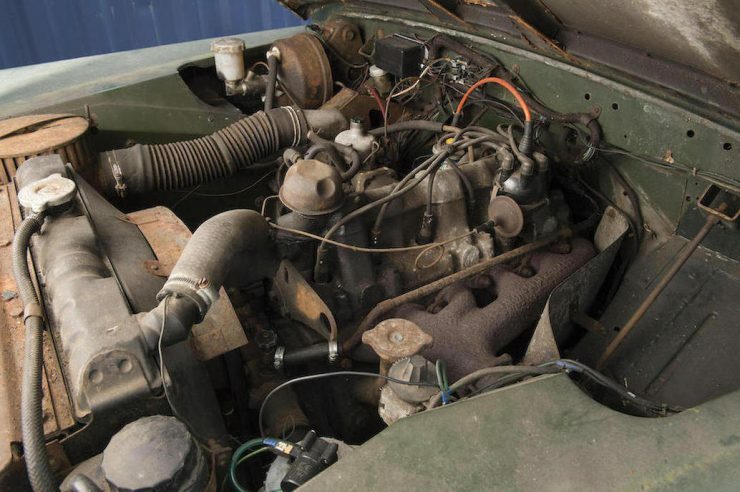 The Series IIa Forward Control model was originally fitted with the 2.25 liter four cylinder engine for 1962 but this was upgraded to the 2.6 liter six cylinder in 1962. 2,091 of the four cylinder Forward Control models were made and 1,097 of the six cylinder. The diesel engine was also available as an option but only five of the Series IIa Forward Controls were made with diesel power. This model was made between 1962-1966 when it was replaced by the Series IIb LWB Forward Control. The Series IIb Forward control was an improved version with a 110″ wheelbase. 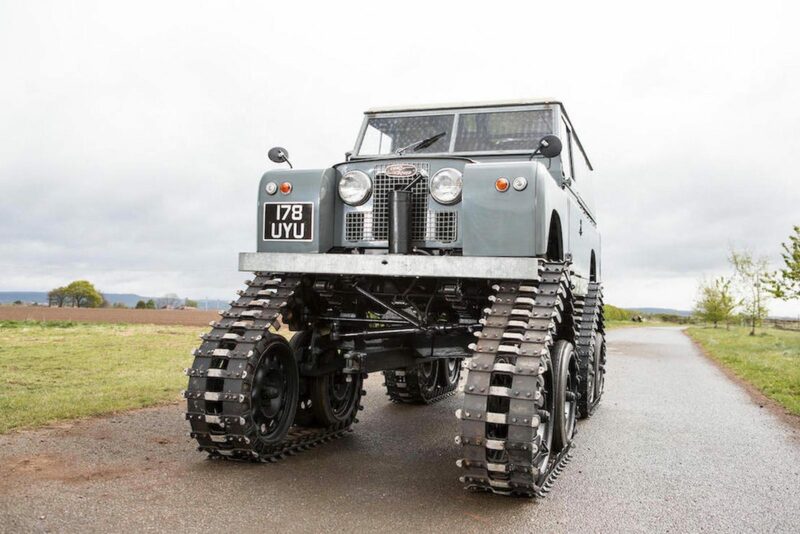 The track was widened to improve vehicle stability and it was fitted with the heavy duty ENV axle that was also available as an optional extra for the Series IIa. The gear-lever and handbrake of the Series IIb were re-located to improve general ergonomics. The Series IIb was only made as a Forward Control model and was in production from 1966-1972. For the UK domestic market the 2.6 liter six cylinder engine was standard but for export markets the 2.25 liter four was offered. The diesel engine was also optionally available. Of the 2,305 built 1,254 were fitted with the 2.6 liter six, 527 with the four, and 524 with the diesel. The Series IIa One Ton 109″ was based on a very similar chassis to the IIb Forward Control but with the standard Land Rover utility body so it looked the same as an ordinary Series IIa LWB utility. The One Ton was fitted with the 2.6 liter IOE six cylinder engine, the lower ratio gearbox used on the Forward Control, and the heavy duty ENV axles front and rear. 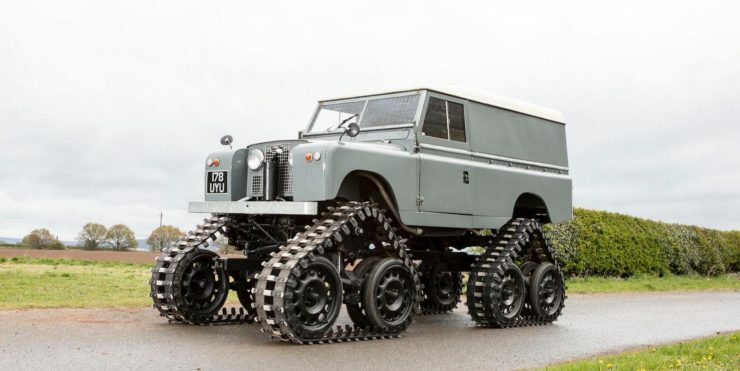 The chassis of the One Ton is somewhat unique to the model and features a drop-shackle suspension like that of the military Land Rovers, and the 9.00″x16″ wheels and tires of the Series IIb Forward Control. Production of this model spans both Series IIa and Series III production over 1968-1977, and with numbers of these vehicles made very low there are some variations and the late production Series IIa One Ton, which were fitted with the Salisbury differential instead of the ENV. With total production in the hundreds this is one of the more rare Land Rover versions and is visually difficult to identify because it looks just like a Series IIa utility. 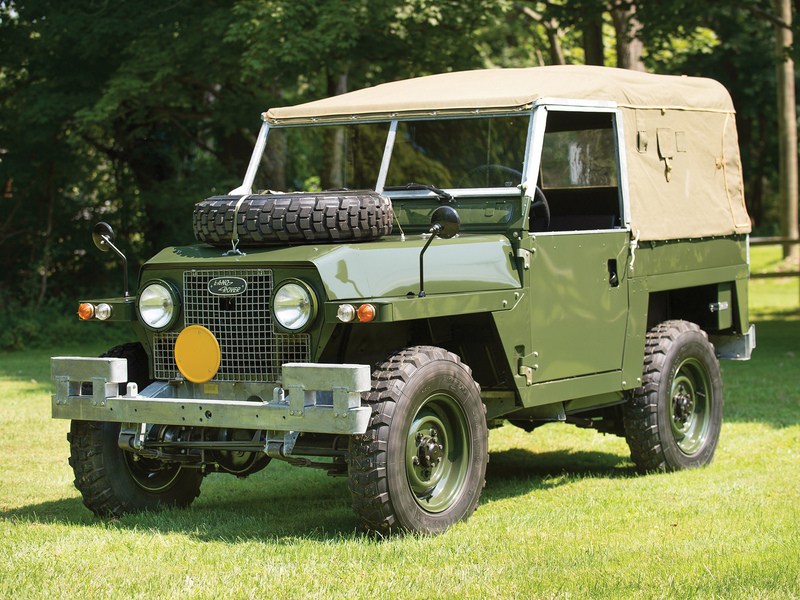 The Land Rover Series IIa is arguably the Land Rover from the “Golden Age” of Land Rovers. Their all metal dashboard may have looked unsophisticated, but access behind the instruments only required four screws to be removed in order to lift out the center panel for repairs. This model earned itself a reputation for being easy to maintain and dependable. About the only area of complaint was that on LWB models fitted with servo assisted brakes it was necessary to lift up the front of the car to an angle of 30 degrees in order to properly bleed the hydraulic brake system, if you did not have access to the equipment to power bleed the brake system. 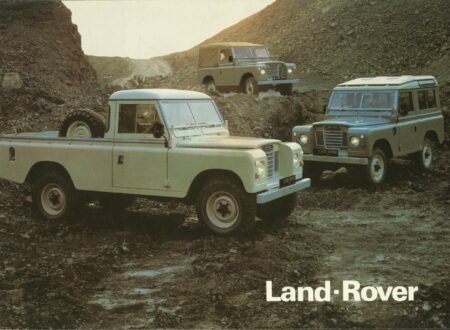 The Series II and IIa are the movie stars of the Land Rover family. Starring in such movies as “Born Free” and other African adventures. These were a vehicle that featured in many untold adventures, adventures that never made it into a Hollywood script. They were the backbone of Australia’s Snowy Mountains Scheme, and one of the most common sights in Africa and the Australian Outback. They were a standard military vehicle, and saved lives in their role with emergency services and in search and rescue operations. 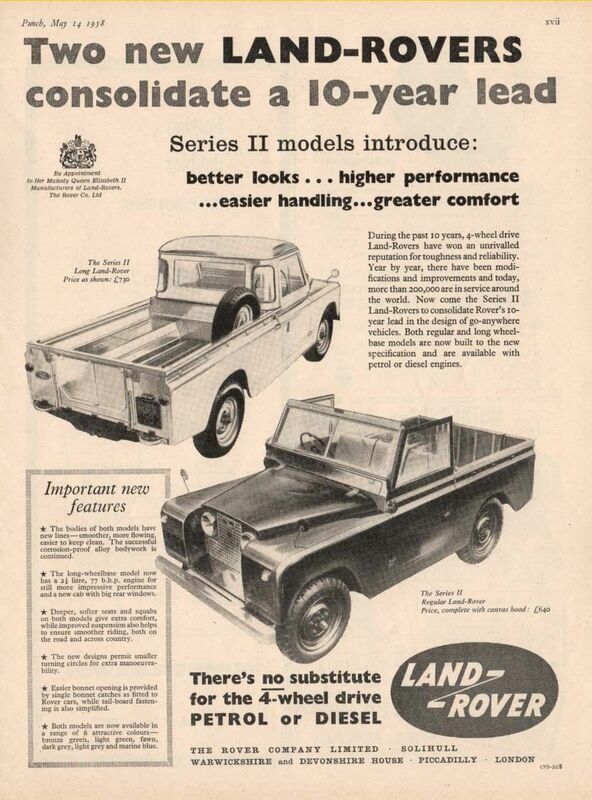 This was the Land Rover that made “Land Rover” a household name. Picture Credits: Rover, Land Rover, Bonhams, Cool N Vintage, Bring A Trailer.